Chief justice explains role of court – Welcome to Wyandotte Daily! Nuss was handing out these cards when he talked to a group of about 50 persons, mostly lawyers, at a meeting of the Kansas Appleseed organization Friday, Dec. 2, at the Spencer Fane law firm in downtown Kansas City, Mo. 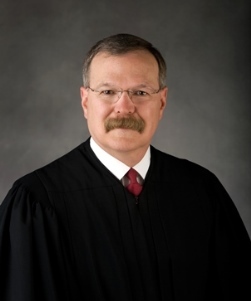 Nuss is the chief justice of the Kansas Supreme Court and admitted that his job isn’t without its challenges. Nuss and three of his associate justices, Dan Biles, Carol Beier and Marla Luckert, survived a very serious challenge from ultra-conservative advocacy groups in the recent November general election. These opposing organizations included Kansans for Life, Kansans for Justice and the Kansas Rifle Association. Gov. Sam Brownback and his conservative allies have advocated changing the way Supreme Court justices are chosen, favoring a direct partisan election. Those of a more moderate political persuasion argue that the present merit appointment system works well. Judges run against their records in nonpartisan elections. The conservatives favoring a direct partisan election of judges, including certain legislators, argue that the merit selection committee is too heavily influenced by trial lawyers. Those favoring the merit selection argue that when judges run in partisan elections, money can be the controlling factor. The Kansas Appleseed organization, including Kansas lawyers, law professors, court professionals and civic groups, sent out letters before the recent general election, encouraging judges to be evaluated on their professional performance and their respect for law and not their fund-raising abilities. Conservatives have complained that the Kansas Supreme Court is a group of activist judges who overexert their authority by “making law.” Nuss was quick to point out that the practice of judicial review has been long established, dating back to the U.S. Supreme Court case of Madison vs Marbury in 1803. Simply stated, the court may rule a law invalid if it finds it to be inappropriate. Nuss also said that one of the ways legislators hamper the court is to deny it proper funding. He has asked the Kansas Legislature for a $20 million increase during each of the next two years. He said that the court system only makes up 1 percent of the total state budget. He said it is difficult to attract employees because of low wages. Although Nuss may well have a valid point, state budget restraints may make the request very doubtful. The Kansas Supreme Court is expected to rule on state funding for education sometime during the next few weeks. Some statehouse pundits have speculated this could add as much as $500 million to an already severely strained budget. Conservative critics of the court again point to activist judges who would encroach into legislative matters with such a ruling. Murrel Bland is the former editor of The Wyandotte West and The Piper Press. He is executive director of Business West.